← Minutemen. Meatpuppets. Descendants. Angst. Mr. Wang: 喂，你好 Jonas. Why are you not in class? Jonas: What? Why am I not in class? Of course I’m not in class, I don’t have class right now. Mr. Wang: Yes you do. Jonas: No I don’t. I don’t have class until next period. Mr Wang: You have class right now. Senior 1 #10. Jonas: No, I have them next period. Mr. Wang: No, they’re waiting for you in the classroom. They’ve been waiting for 25 minutes. You should be there. Pay attention to your schedule. Jonas: But my schedule says I don’t have that class until next period! Mr. Wang: You have them now. We changed your schedule. Get to class as soon as possible. Jonas: You never told me you changed my schedule? How can I know I have class if you haven’t told me my schedule was changed? That was last Monday. And that evening, my schedule was changed again – though this time I had enough advance notice to actually make it to class on time. This kind of screwup is slightly embarrassing for me (to enter a class 25 minutes late) – though the students gave me a knowing “ahhh” when I apologized and said that I hadn’t been told about the switch – but Mr. Wang and the others took it in stride: they never really apologized or showed that they cared too much; it was all just a matter of course. I went to Mr. Wang’s office after the class and told him that I’d like at least 15 minutes notice before a class which isn’t on my schedule. Then I asked him if Kim’s schedule had changed too. “Of course,” he said. I really don’t mind the schedule changes, but the total absence of advance warning offended me a little. I’m probably overinterpreting, but the total absence of advance warning and the administration’s offhanded method of dealing with my request made me feel as though the school couldn’t give two shits whether I exist or not, not to mention whether I actually make it to class. I hope that I care enough about education in general – and my students specifically – that I never make it to this point of apathetic agnosticism concerning education. But I’m definitely throwing it on a bit strong here, for it seems that the status quo is that nobody ever knows what’s going on. The few times when people do know about something, us foreign teachers are always the last to learn about it, and we always learn about it indirectly, through non-official channels. Take the upcoming vacation schedule: in addition to the weeklong October 1 holiday, there were widespread rumors that we’d have some time off this upcoming week for the Mid-Autumn Festival, a traditional Chinese holiday. I pestered Mr. Wang every day last week, but he always told me he didn’t know what was going on and would tell me as soon as he knew. Last Thursday, I got to my Senior 2 class 13 about ten minutes early and one of my better students writing something on the board; what he was writing looked suspiciously like a calendar, with a list of dates and scheduling information . “Is this a calendar for next week?” I asked. “Yes,” he said. He explained what would be happening: Monday and Tuesday would be normal schedules, we’d have a Mid-Autumn Festival break on Wednesday and Thursday, and then school would be in session for seven straight days (through the weekend) all the way to the beginning of the October 1st holiday – with a wacky schedule, no less (who knew that weeks went F-W-Th-M-T-W-Th?). I wrote down the calendar thanked my students profusely, and after class went to Mr. Wang to ask him about the schedule. “Yes, that’s right,” he said. On a positive note, teaching has been going very well. I’ve been trying to make it through the week without losing my voice – my voice is relatively quiet and I have to yell to be heard in some classes – but by the end of most days, I had tired out my vocal chords and gained possession of an endearing little croaking cough. However, by the end of the week I had worked out some new methods to quiet down the students: taking away papers from other classes, relentlessly seizing cell phones, sending kids to the office, and standing silently in front of the class – with an angry look on my face – until the kids shut up. I think it’s working; even class 14 was comparatively quiet (e.g. rowdiness level only 7 of 10) on Thursday. Hopefully I can further develop my methods for pacifying the hormones during class; I don’t mind being seen as a hardass as long as I can actually accomplish things in class. On Friday, the English department had a banquet at a 清真 hotpot restaurant across the street from campus. The food was amazing and it was fun to meet the other teachers, though I feel like there’s still a significant barrier between the foreign English teachers and the Chinese English teachers; most of the conversation at the tables was gossip about mutual friends, and though I understood a good bit of it (it was in Chinese) I was definitely not included in most of the dinner table conversations. I’d like to learn more about the other English teachers and maybe make some friends, but it seems like a difficult community to make your way into. Aside from school, I’ve been pretty busy. I’m going to start volunteering with ETP this week, tutoring a TOEFL class for five advanced students (I’m also working on 拉-ing my 关系 at Bowdoin to try and get some admissions help for these truly amazing students. ASIDE: If you know anyone who could help them admissions-wise at any decent US college or university – they need full financial aid – please email me!). 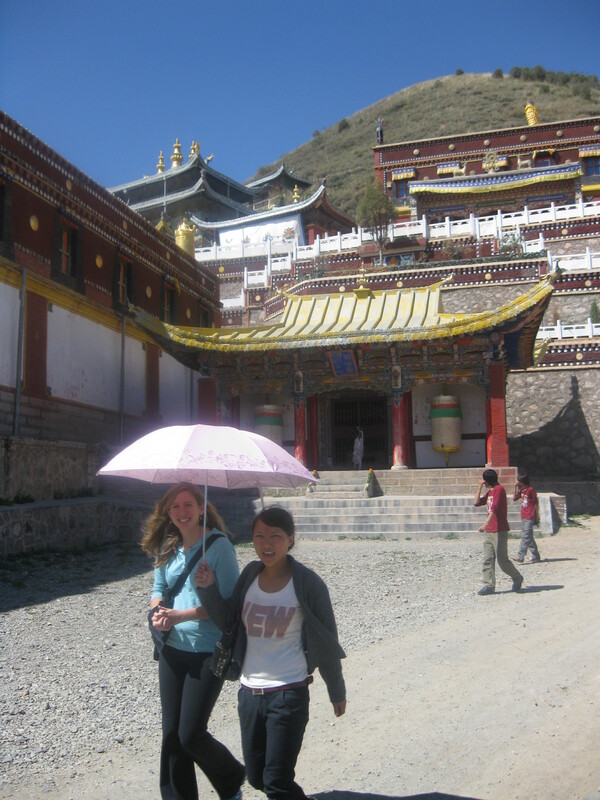 I had met some of the students I’ll be teaching last week, but I met more this Saturday when we went on an excursion to Shacheng Monastery 夏琼寺), a Tibetan monastery in Hualong county perched spectacularly on the edge of a cliff overlooking the (strangely clean and clear) Yellow River. 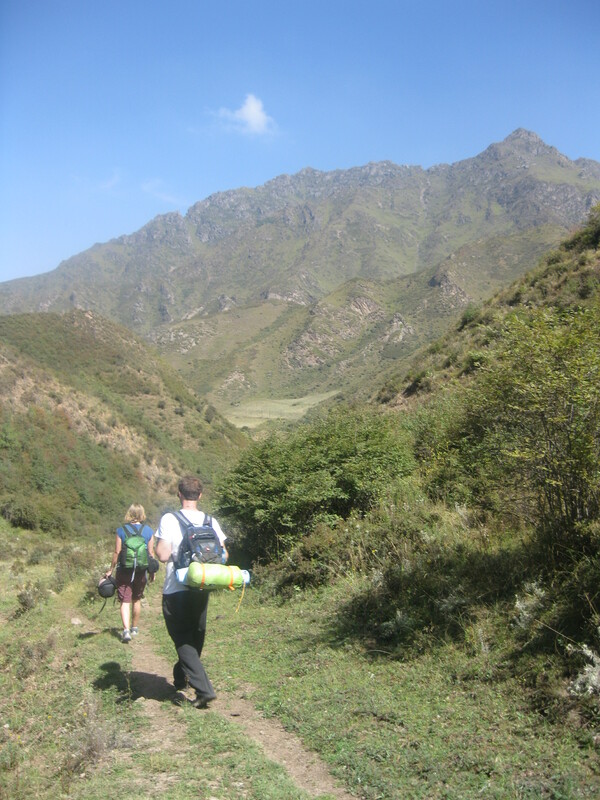 The trip to the monastery was exciting: first we went to Ping’an to pick up materials for a picnic (白酒 included, of course) before climbing into the mountains and crossing a high pass. 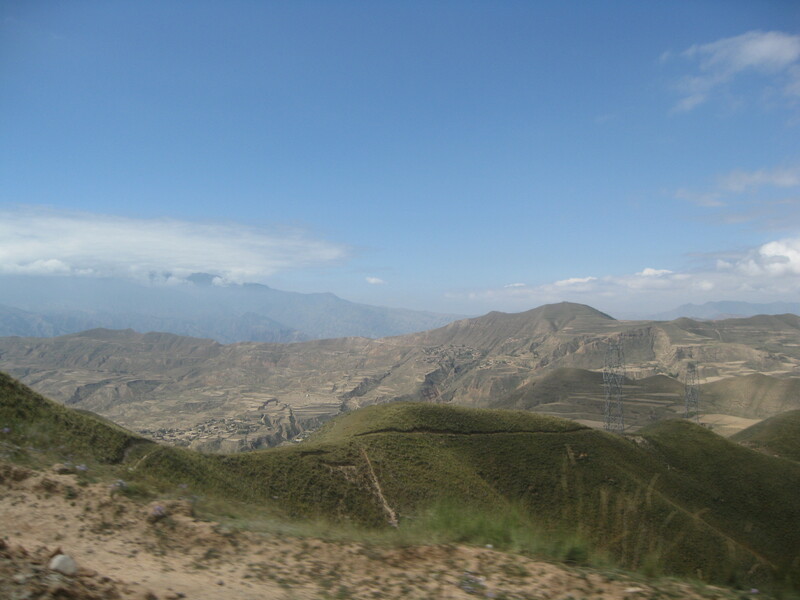 Our minibus ran up and down a series of beautiful, broad valleys at the base of the mountains before turning onto a narrow one-lane road which contoured around a steep hillside before running spectacularly along the spine of a knife-edge ridge. 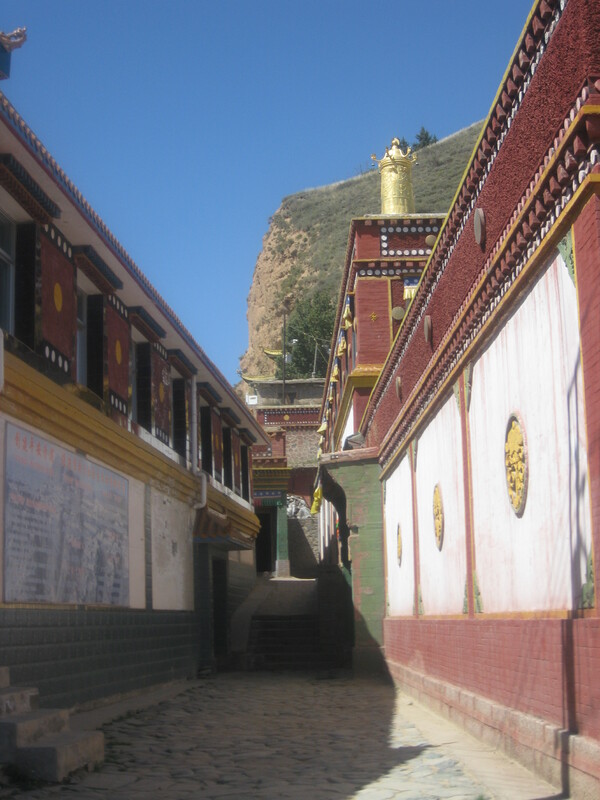 At the end of the ridge, we passed through a gate and entered the monastery town, built into a natural amphitheater along the side of the ridge. 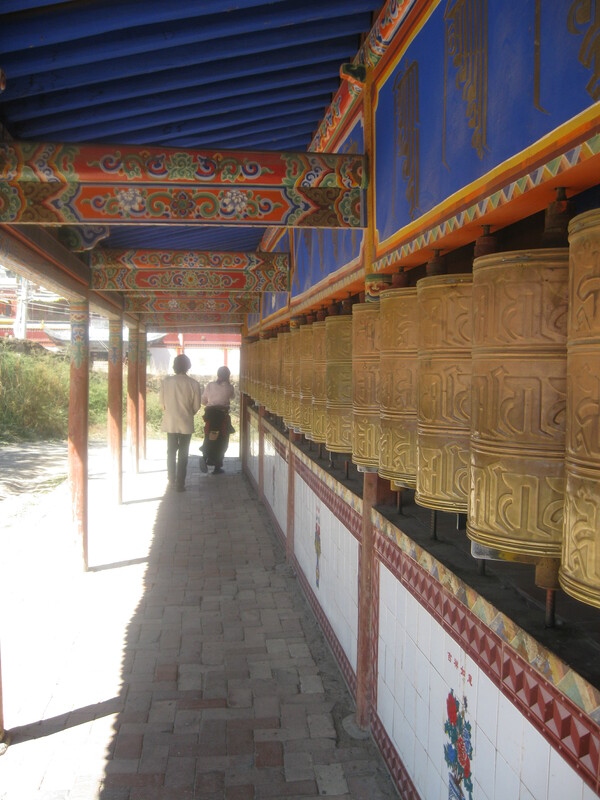 Capping the ridge was the monastery itself, beautiful and quiet, with pilgrims circling through the chapels and spinning the prayer wheels. 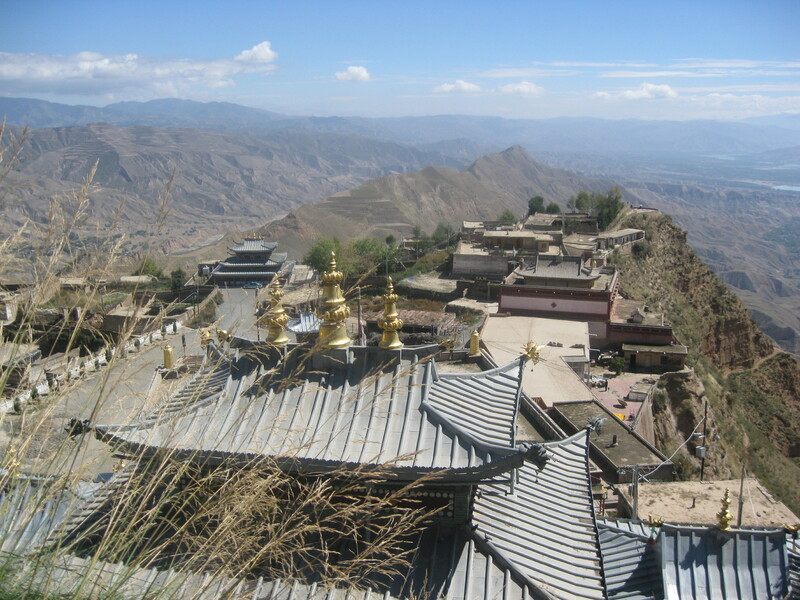 At the monastery’s far edge was a massive cliff which provided spectacular views of the Yellow River valley and beyond; even the toilet was located at the cliff-edge and equipped with plentiful windows (and ventilation; it’d be a cold one in winter). 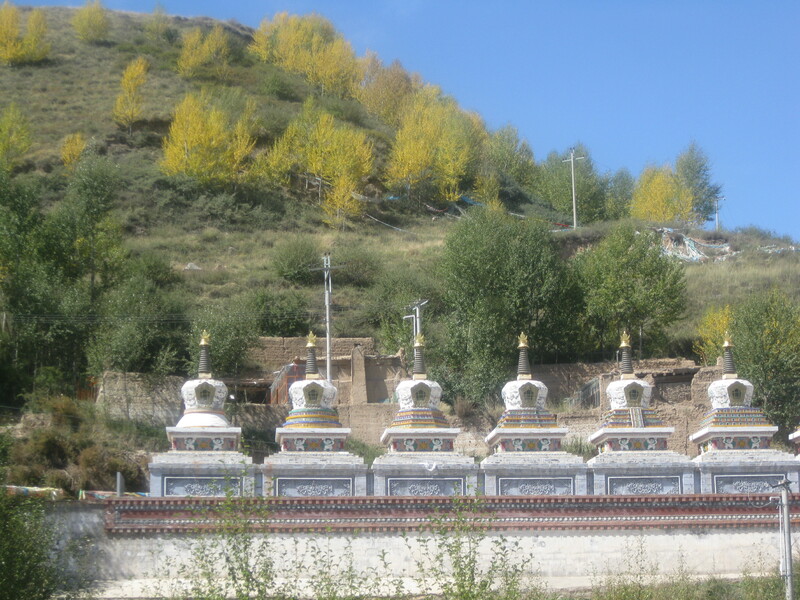 After spending some time at the monastery, we backtracked along the ridge and found a nice place for our picnic. We had a feast: bread, cold dishes, lamb, and of course 白酒, beer and even some wine. After we finished eating (though the 白酒 was still making the rounds), we sang English and Tibetan songs and played volleyball and soccer on the road. 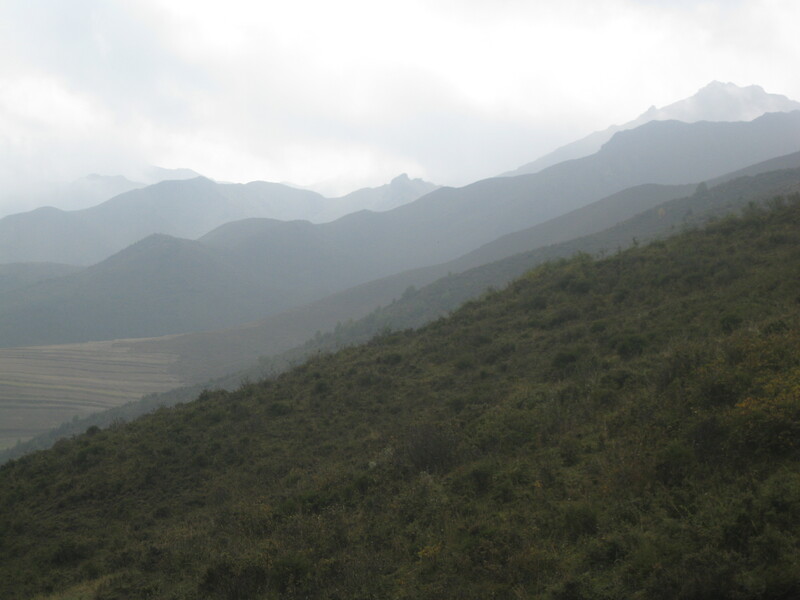 I wandered up to the hilltop for great views of the valley and mountains; even in a totally random spot in Qinghai, the scenery is unbelievably beautiful. Finally, we had to leave, and we went back up into the mountains on our minibus, leaning our heads out of the window to catch the wind in our faces, singing all the way. 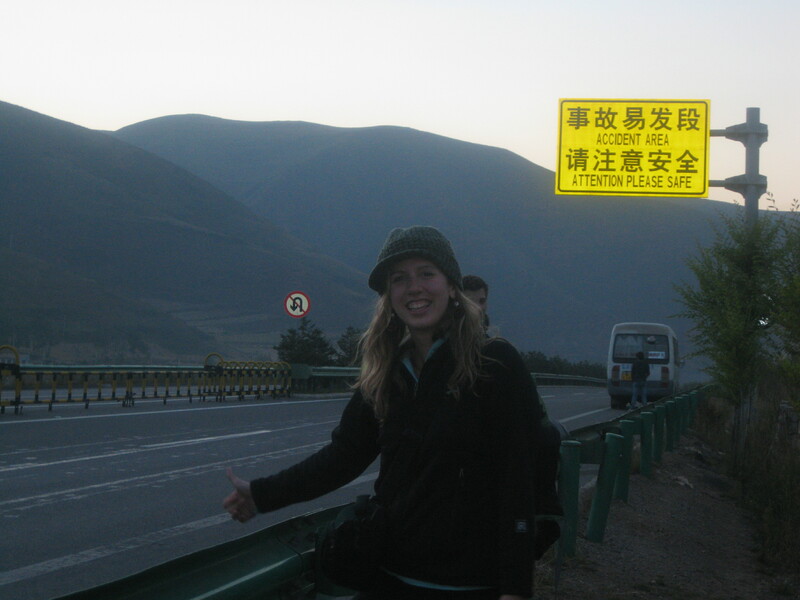 All week long, Sarah, Devin and I had been planning to camp out somewhere Saturday night and hitch back to Xining the following day. This past week, we’d been amassing our camping gear: Sarah and Devin had bought a tent, and I had bought sleeping pads and some snacks so we’d be able to spend the night somewhere (Sarah has a water filter and camp stove coming in a package, which has unfortunately been held up in Xi’an for more than a week). 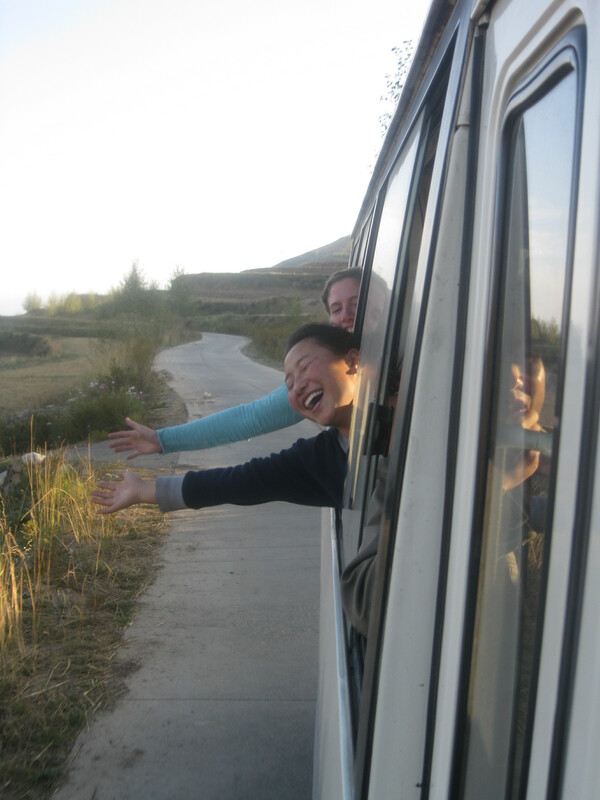 On the drive back, we asked some of the Tibetan students if they could recommend a good spot where we could get off the bus to camp, but we drove and drove and kept singing and singing and the matter was forgotten. Suddenly we were on the big highway heading through the tunnel through the mountain range towards Ping’an. I didn’t even know if we could get on and off the highway, or if we would find a decent (and quiet) spot to camp. We exited the tunnel, and the highway curved around the mouth of a steep side valley, which looked as if it wound up into the higher mountains. A one-lane concrete road ran under the highway overpass and along the valley floor, then around a hillside and out of sight. I knew it’d be now or never, so I told the students to have the driver let us out by the side of the road. 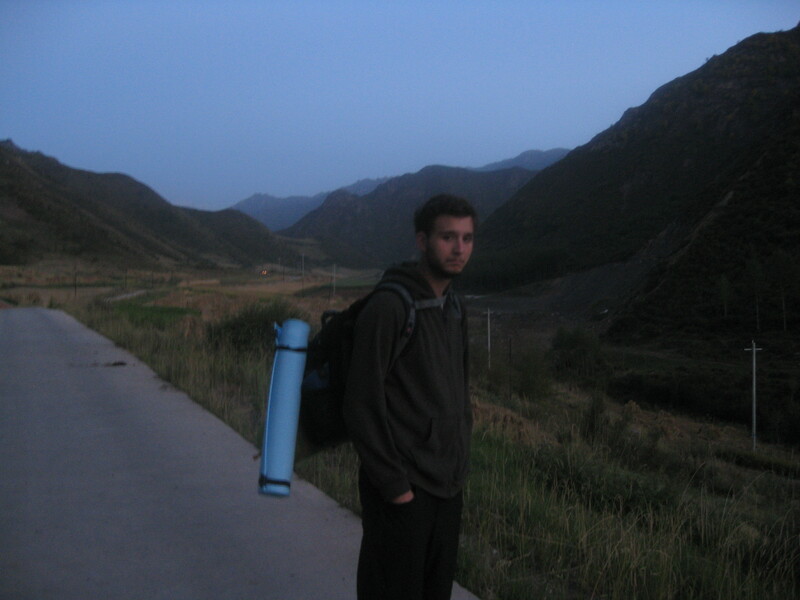 We slowly pulled to a stop and unloaded our stuff; we said our goodbyes and the bus pulled away and sped downvalley towards Ping’an, leaving us foreign hobos by the side of the road in the gathering darkness. We jumped over the guardrail and walked down to the one-lane road below the highway, then followed the road up the narrow side-valley. The road soon entered a small village at the valley’s mouth, where old women peered out of doorways at the strangers walking by in the dusky gloom and small children skittered across the empty street. 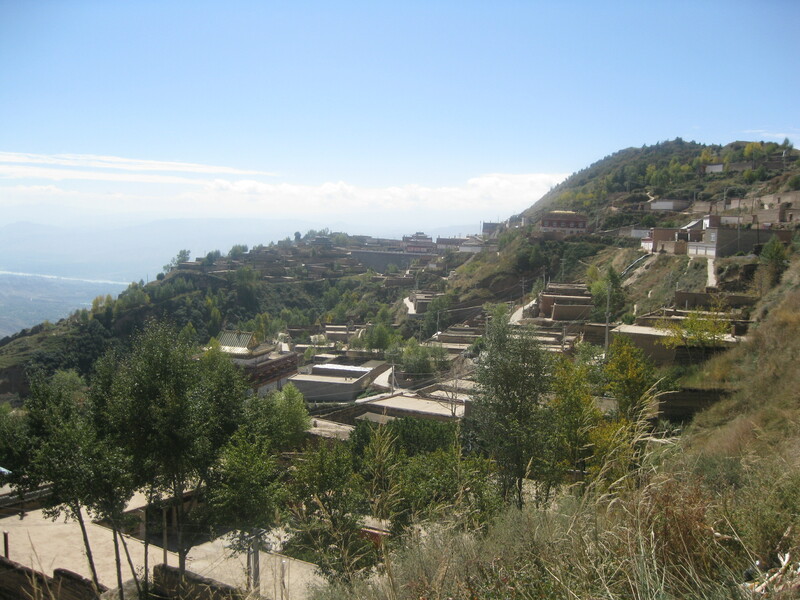 The road rose through the village and around a hillside into a beautiful, open valley, jagged peaks towering above open meadowy pastures and terraced fields of wheat and barley. It was getting dark, so we found a flattish spot and camped in an open wheat field which had already been harvested. The site had a great view of the valley; we watched the final glowing embers of sunset, the moonrise, the increasingly intense and brilliant stars which soon spackled the sky with their glow. 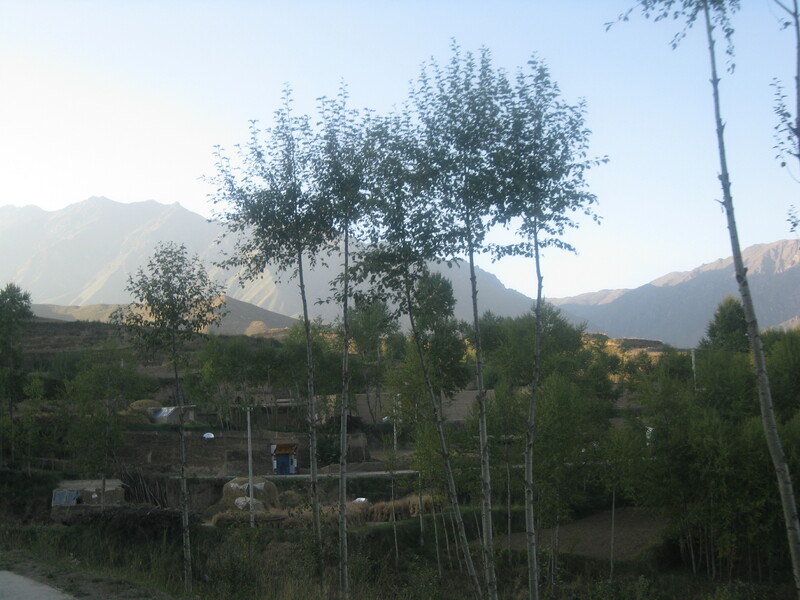 Though we were no more than a kilometer or two from the highway, the valley was intensely silent. The next morning, we woke up to fog covering the peaks. 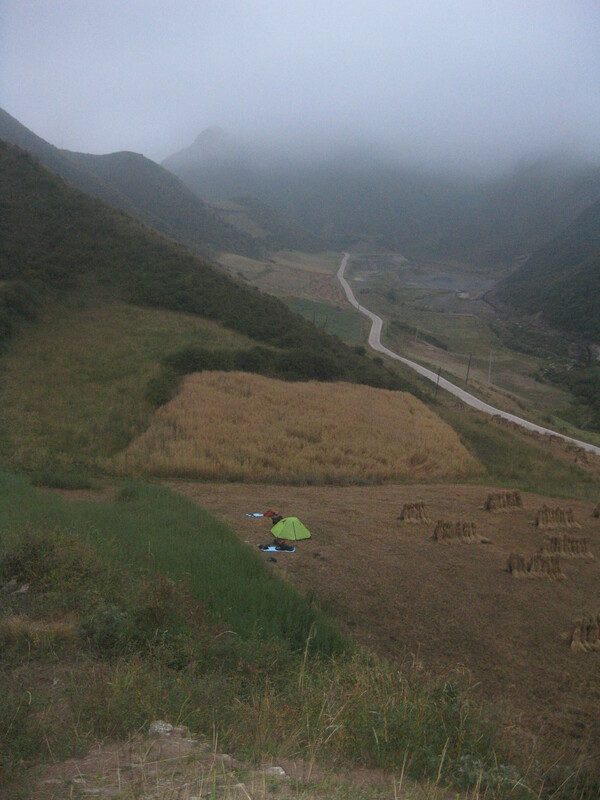 I had slept outside, and had not slept too well; our cheap sleeping pads were being porcupined by the stalks of wheat and the uneven ground below (even though we’d flattened out the stalks beforehand). Soon after I awoke, I heard mooing rising up from the field below us. A herd of bulls quickly came into view, along with two Hui shepherds who quickly became more preoccupied with us than with their herd. We quickly packed up, thinking they wanted to run their herd through the field where we were camping, but instead they wandered up the hillside above our camp. One man sat out on a rock, pulled out a pair of binoculars, and started staring at us. I waved at him, he waved back and put away the binoculars. We heard the two men talking; silly stupid foreigners, camping in a wheat field! 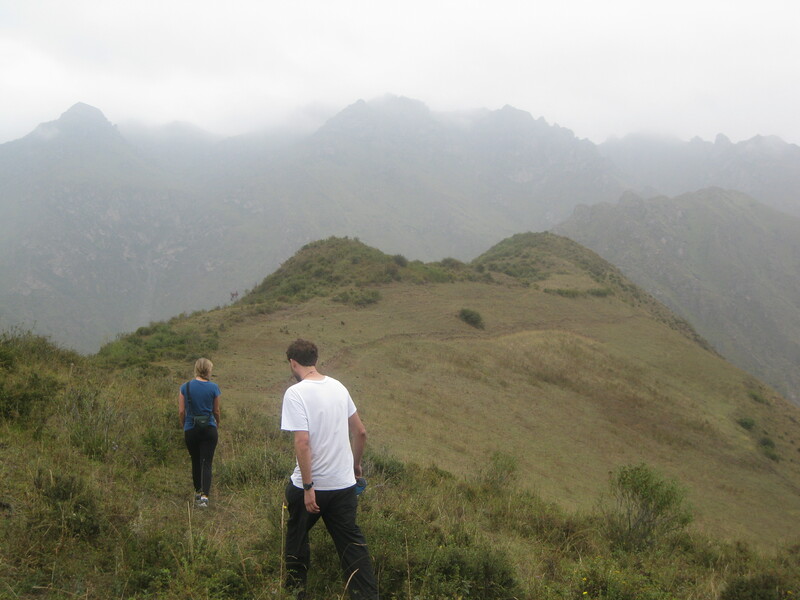 We packed up and walked up the beautiful valley. The scenery was amazing; the trees and shrubs were just starting to turn yellow in anticipation of autumn. 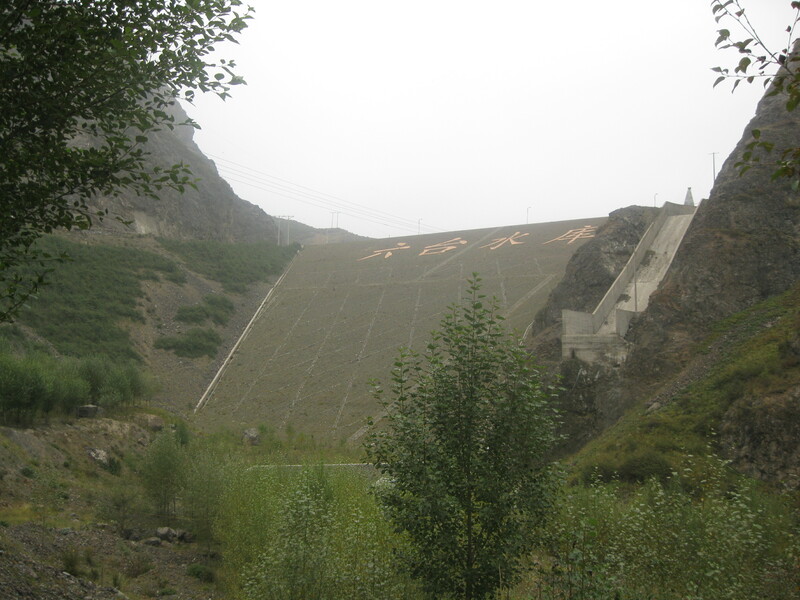 We turned the corner around a bend in the valley and saw a large dam running across the valley’s narrowest section, holding back what a large sign said was the 六台水库 (the Liutai reservoir). The dam was a depressing spectacle; tall, uglily monolithic, though dwarfed by the surrounding peaks, it seemed to dominate them all in its unexpected presence. 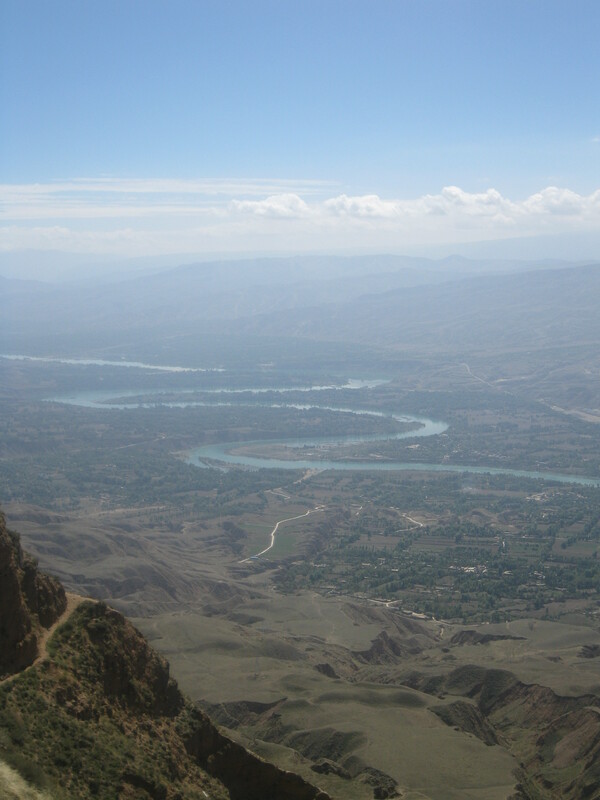 We went back downvalley and decided to walk up a steep gorge running towards higher peaks. 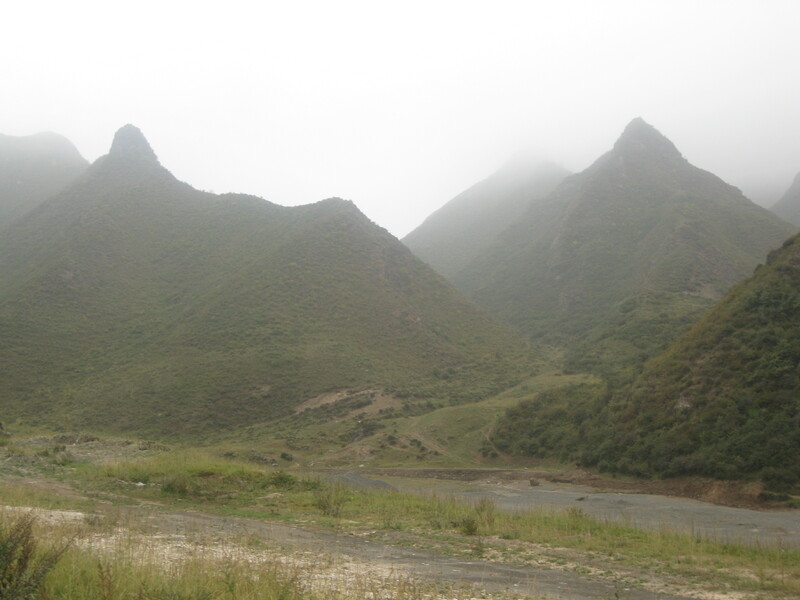 A herder’s path ran along the bottom of the narrow gorge, which was lined with sharp pinnacles of rock; after about thirty minutes, the gorge opened up into beautiful marshy upland meadows. We climbed towards a pass where cows grazed contentedly on the rich grasses above another tiny village in the next valley over. We traversed a grassy bowl to another pass, where a beautiful view opened up. Below us lay the (surprisingly small) reservoir held back by the dam, but above the reservoir was a spectacularly beautiful valley which stretched far into the distance, towards higher and higher mountains. 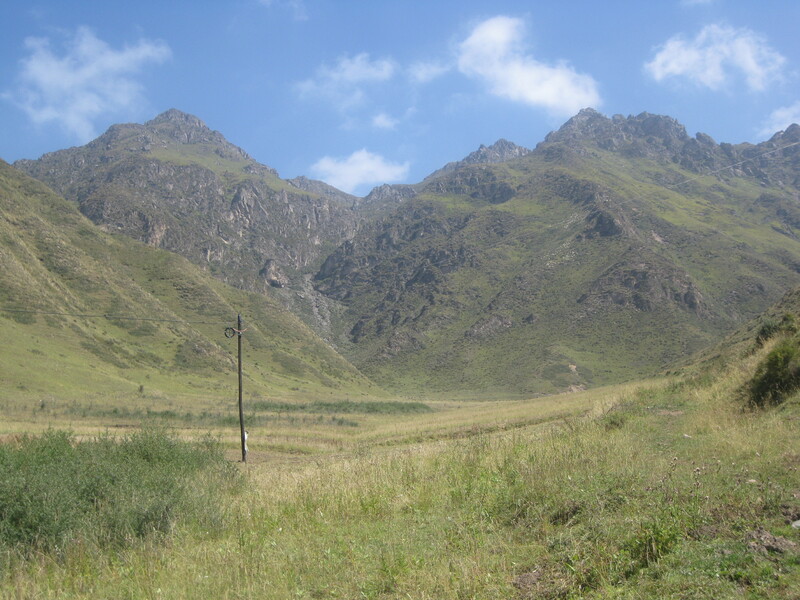 The mountains’ folds, gentle slopes to the south contrasting with steep cliffs to the north, enveloped the peaceful valley, whose floor was carpeted with wheat fields. Sheep and cattle, appearing as tiny specks of white and gray from our viewpoint, grazed peacefully along the hillsides. 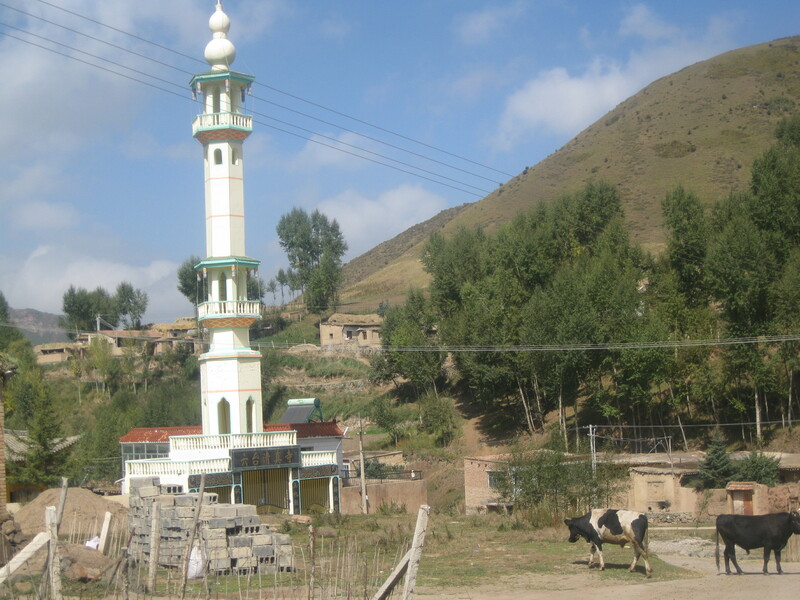 At the bottom of the valley was small village, a cluster mud-and-brick dwellings pierced at its center by the single slender white minaret of a mosque. The sun was coming out, the wind blew gently along the ridgetop, and the cows were mooing in the distance; we couldn’t resist the valley’s bucolic perfection, so we went down the hillside to explore. 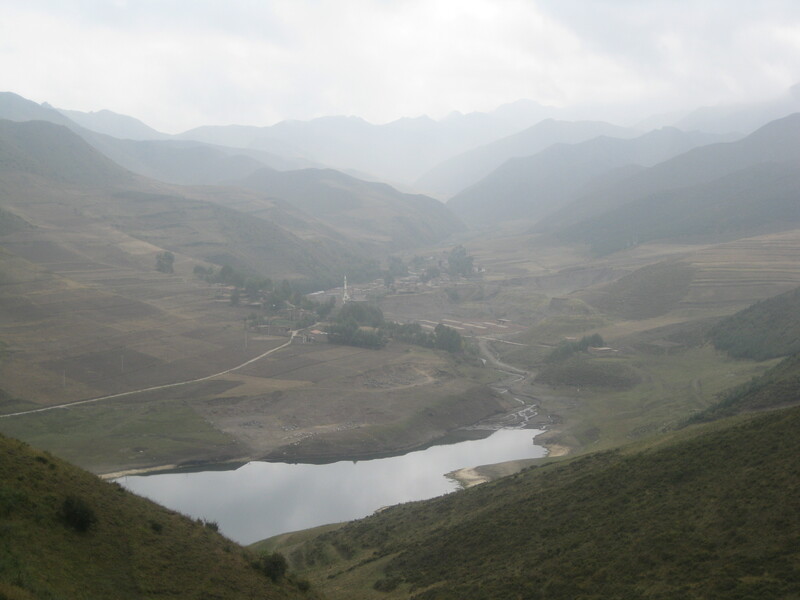 We walked along the reservoir, through some pastures, and into the village outskirts. At every house we passed, intensely curious faces stared out at us. At many houses, a simple “你好” brought out all the curiosity. The families would come out, small children and adults alike staring at the strange 老外’s and peppering us with questions. Despite the ferocious-looking dogs chained up at many of the houses, the families we met were extraordinarily friendly; they welcomed us to their village and displayed us proudly to their children, who stared in wonder and fear. 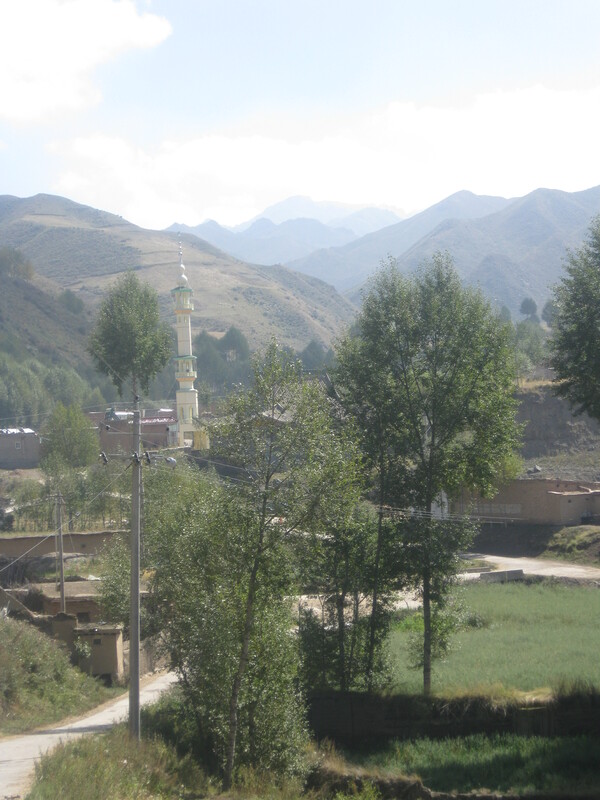 We wandered to the center of the village, where a small crowd gathered below the mosque for the slaughtering of a cow. The cow’s throat was slit, and was allowed to die before it was hacked apart and it’s body parts were put in different bags (except the intestines, which were allowed to dry in the sun). After the cow, a couple of men went to a nearby herd of sheep and chose one for slaughter; they carried the sheep kicking and screaming (literally) to the killing site and with one cut of a knife ended its suffering. The sheep lay twitching on the ground while the men smoked cigarettes, then began the work of skinning and disemboweling the animal while babies looked on from their mothers’ arms. The work of slaughtering was done quickly, efficiently, routinely, like any other job. 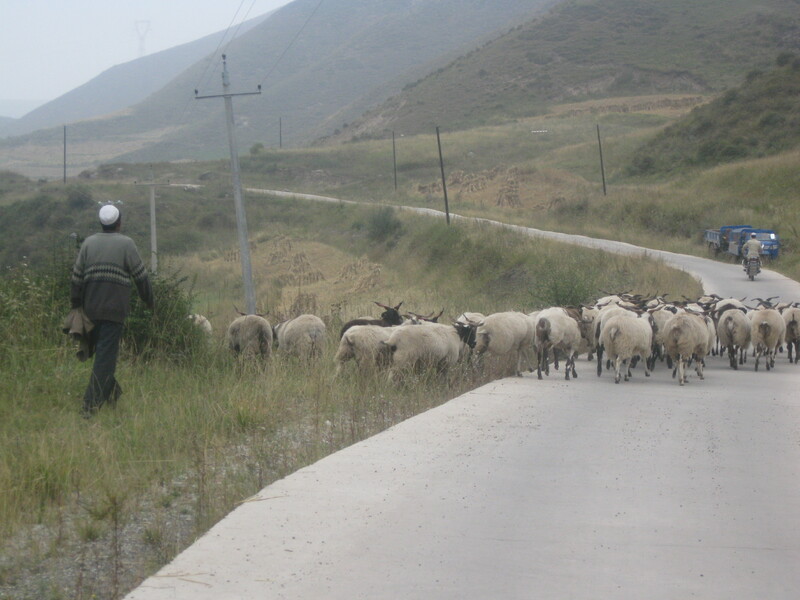 The village was permeated by the smells and sounds of sheep and cattle, so it was no surprise that we’d be seeing a slaughter. But we were in a state of mild shock nonetheless, a state which was only heightened the villagers’ total nonchalance. Regardless of the gore involved, I was happy to see the slaughter; I feel much better eating meat from a cow or sheep which spent its days grazing on grass in this bucolic valley before being killed quickly and efficiently – a death which is as humane as death can be, if one can apply the adjective ‘humane’ to slaughter. 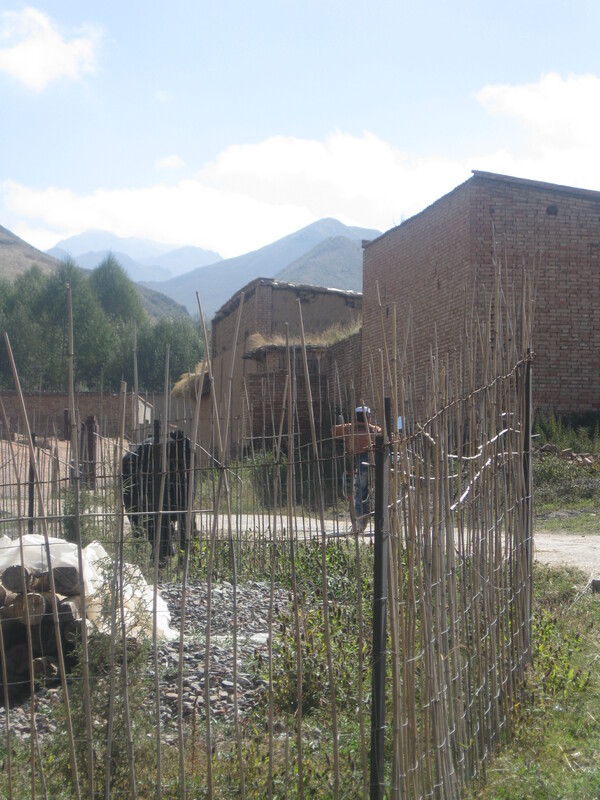 We wandered through the village, meeting families and watching the ongoing rituals of the harvest season. Piles of wheat lay in the road, tractors running back and forth over the wheat to simplify the threshing process; herds of sheep and cattle wandered in and out of town; in courtyard homes, families separated wheat grains from dirt that had become mixed in; meat hung out to dry outside gates, and was bagged for the market or for families’ consumption. Everywhere was evidence of the valley’s relative prosperity; abundant harvests, well-built and well-kept homes, beautiful kitchen gardens. 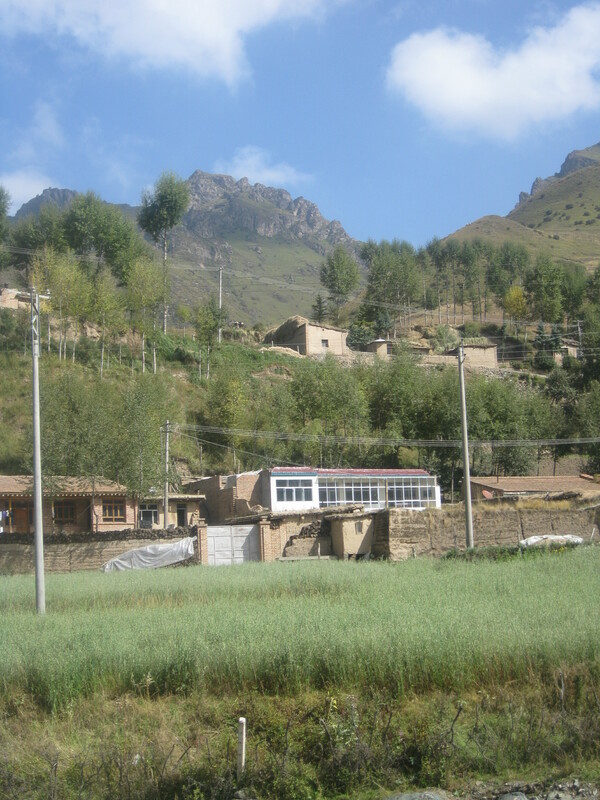 But more than any other place I’ve been in the Chinese countryside, the village felt lived-in. Many villages in China have been deserted by anyone of working age; only children and grandparents live in this newly-quiet countryside. 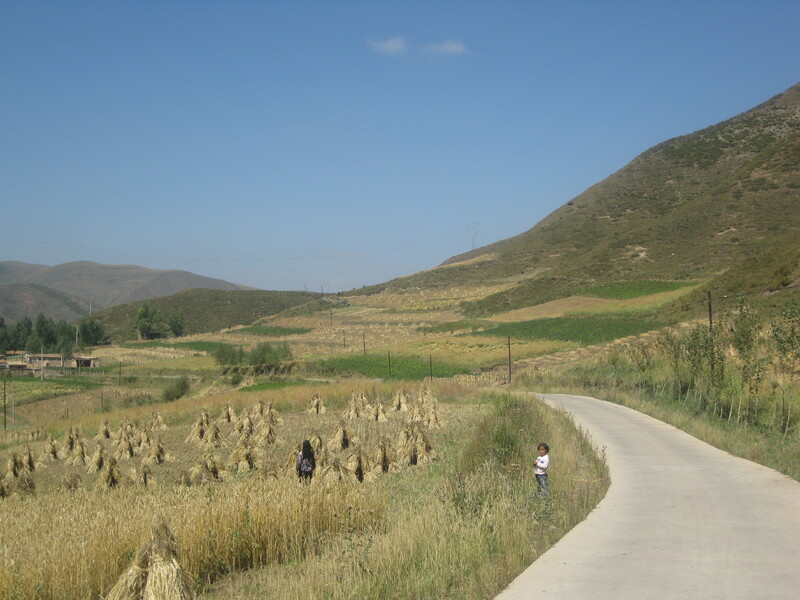 But in the village of 六台, extended families worked together to collect the harvest; every family still seemed intact. I wondered why this was: was the valley prosperous (or beautiful) enough that nobody felt the need to leave? why was everyone still here? I don’t know why, but what made this village magic (besides the scenery) was the fact that it was still fully inhabited; that it was still entirely alive. We finally had to tear ourselves away from the village and head back downvalley towards the road. 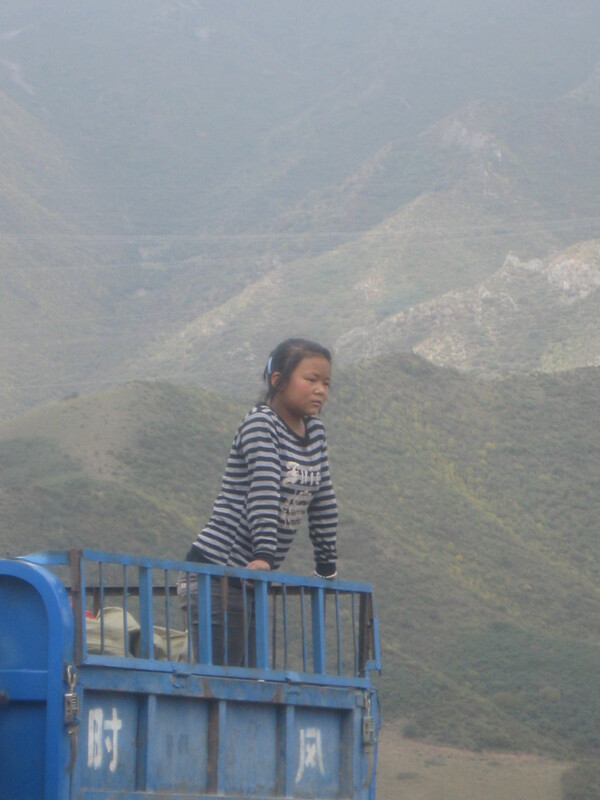 After a good hike (through the now-searing midday sun), we came out at the bottom of the valley and hitched a ride with a police car back to Xining. What made this adventure truly special for us (at least for me) was it’s total randomness: we were dropped off in a random spot on the side of the road that turned out to be one of the most beautiful and perfectly bucolic places I’d ever been. If only I had more adventures like that. That’s all for now! I don’t know when I’ll be posting next, because (as implied by the post’s title) I don’t know what’s going on right now. But I’ll update whenever anything happens.